The barriers that separate fantasy from reality are shattered in this stylish, mind-jarring thriller, where two parallel worlds collide in a paroxysm of deception, madness and murder. On the thirteenth floor of a corporate tower, high-tech visionary Douglas Hall (Craig Bierko, The Long Kiss Goodnight) and his high-strung colleague, Whitney (Vincent D'Onofrio, Men In Black), have opened the door to an amazing virtual world - circa 1937 Los Angeles. But when the powerful leader of their secret project (Armin Mueller-Stahl, Shine, The X-Files) is discovered slashed to death, Hall himself becomes the prime suspect. Arriving from Paris is the beautiful and mysterious Jane Fuller (Gretchen Mol, Rounders), claiming to be the murder victim's daughter. Her instant, magnetic attraction to Hall only further blurs the lines of what is real. Is he the killer? Is the inscrutable Jane somehow connected? To find the answers, Hall must cross the boundaries into the simulated reality he has helped create - and confront the astonishing truth about his own existence. 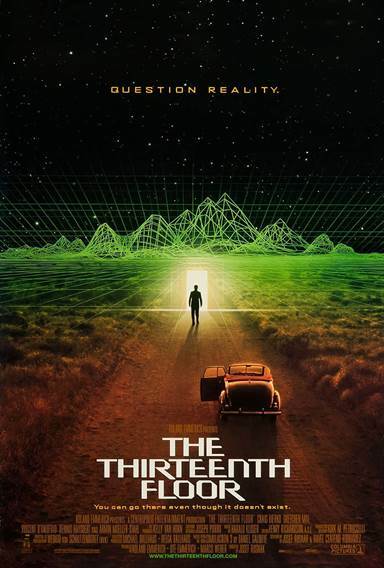 Download The Thirteenth Floor in Digital HD from the iTunes store. The Thirteenth Floor images are © Columbia Pictures. All Rights Reserved.